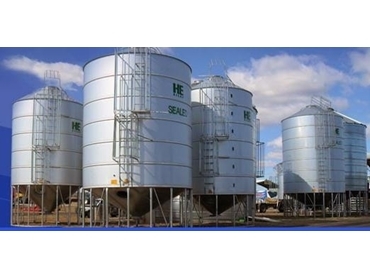 Since 1968 Australian owned company HE Silos have provided a range of silos for grain storage requirements. Grain silo’s are a sealed and standard silo that require zero maintenance and have a fully welded base. The zicalume wall and roof of the silo helps to keep grain cooler and aeration can be fitted to all models for maximum grain control. The seed silo has a 45 degree cone which makes emptying easier. Like the grain silo, the seed silos have zicalume walls and and all galvanised base. The superphosphate silo has a galvanised base which is also anti corrosive. With epoxy coated high build base and walls, this silo is always well protected.